OTTAWA - A handful of Conservatives rallied behind MP Stephen Woodworth's final bid Friday to have Parliament study the definition of a human being, a motion criticized by the opposition parties as reopening the abortion debate. The final debate on Woodworth's private-member motion was often passionate, and sometimes partisan. A vote is scheduled Wednesday. Liberal MP Massimo Pacetti was first to speak to the motion, declaring his party firmly opposed. "In reality, this is just a back door to reopen the debate over abortion in Canada, and a debate that has been closed for many years," Pacetti said. "This issue has been laid to rest in the minds of so many Canadians, and frankly I share the astonishment that we are again in this House needing to debate something for which so many women and men fought tirelessly decades ago." But Woodworth and his supporters went to great lengths to emphasize that his motion was only about studying the question of when a child is considered a human being under the Criminal Code's section on homicide. The idea would be to appoint a 12-member committee — with a Conservative majority — to undertake the analysis. Some pointed to Justice Bertha Wilson's statements during the landmark 1988 R. v. Morgentaler Supreme Court ruling that legislators should decide when a fetus deserves state protection. She suggested it might be "somewhere in the second trimester." Currently, a child is a human being when it emerges completely from the womb — whether or not the umbilical cord has been severed, it is breathing on its own or has "independent circulation." "This definition of a human being may have made sense when it was written 400 years ago, when leeches and bloodletting were standard medical treatment," said Conservative MP Stella Ambler, referring to the view that the definition dates back to 17th century British laws. "People then knew nothing of a child's development before birth, but does this definition of a human being make medical and scientific sense in the 21st century?" The NDP's Irene Mathyssen countered by suggesting the motion was part of a pattern of moves by the Conservatives aimed at weakening abortion rights in Canada. She pointed to the recent decision not to fund abortions in the developing world by the Canadian International Development Agency. "The motion being debated in the House today is nothing less than an attempt to reopen the abortion debate in Canada," said Mathyssen. "This is quite literally a slap in the face to women who have fought long and hard to control their own bodies and their ability to determine for themselves when they wish to have children." 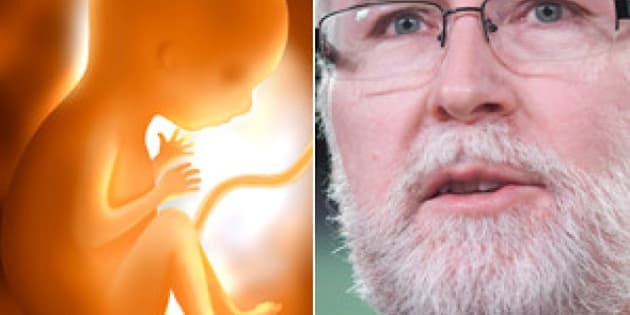 Prime Minister Stephen Harper has said he will vote against Woodworth's motion, consistent with his position that he does not want to revisit the abortion issue. Outside the Commons, Conservative MP Cathy McLeod agreed with the opposition assessment of Woodworth's motion. "I perceive this as opening up the abortion debate and again, that's against my commitment to my constituents," said McLeod. Woodworth wrapped up the hour-long debate by calling for an open dialogue in Parliament on the issue. "We're here to seek out a spirit of compromise amid passionate debate. We are here to embrace advancing knowledge in the service of universal human rights," Woodworth said. "Motion 312 honours those essential duties." The main Canadian political discussion thread on Twitter lit up with vitriol from both pro-choice and pro-life advocates. "So, filling in a census form is an invasion of privacy, but forcing me to stay pregnant against my will is 'human rights'?" tweeted @Ibis3. "How can Canada be a world leader in women's rights when we kill preborn children for being female?" Campaign Life Coalition's Alissa Golob tweeted to Mathyssen.